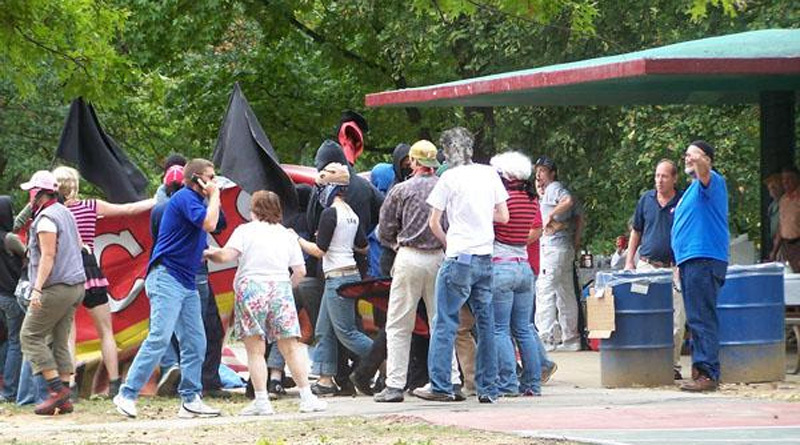 by Earl Holt III — On Saturday, September 30, 2006, our annual CofCC picnic in St. Louis was attacked — and our members violently assaulted — by an armed group of self-styled “anarchists” and communists from my Alma Mater, Washington University. We routed them and gave a richly-deserved beating to those who didn’t run away. At the time, our late CEO Gordon Baum asked that we not publicize this incident, because he feared it might scare away members. I choose to retell it here for two reasons: First, such violence has become a common tactic for commie trash, who are no better than the ghetto trash they champion; And, secondly, our experience that day proves that force is the only thing these vermin really understand. These dilettantes and would-be “revolutionaries” were part of the same bunch who disrupted the World Trade Organization meetings in Seattle in 1999, and which later planned to disrupt the World Agricultural Forum held in St. Louis in 2003. They were prevented from accomplishing their latter objective when many were peremptorily removed from their cockroach infested dwellings by St. Louis’ Finest, and then led off to jail. They marched into the park where we were quietly and peaceably assembled, charged up to us in order to confront and incite us, kicked over tables laden with goods, and then attacked us with hockey sticks which they brought. They wore predominately black clothing and black balaclavas to obscure their identities, and had affixed black flags to their hockey sticks. To say they engaged in “Brown Shirt” tactics is a gross understatement. What they didn’t anticipate was the phenomenon of patriotic and white Americans who were willing to fight back and defend themselves, unlike the effeminate males of dubious gender and Marxist politics with whom they normally associate. We beat the crap out of them. I personally landed five good, right hands to the face of some “person of color,” and in the process, probably made his dentist’s fiscal year, (although further burdening the Medicaid Program.) Meanwhile other members pounded the stuffing out of these pansies. Even Gordon Baum –- almost blind, diabetic, and with only one lung –- chased some college age pansy out to the parking lot, where he confronted the guy between two cars. He was about to administer a beating when this fairy began crying and begged Gordon not to strike him. Gordon was merciful where I would not have been. Another CofCC member was on top of some commie, and proceeded to pound his head into the ground. (As Gordon put it so eloquently: “When your head is on the ground and you’re being hit in the face, there isn’t a lot of room for your head to go.”) After only a couple of minutes, the rest of them ran away and slithered back under the wet rocks from which they had earlier emerged. For too long we have been the targets of assaults by communists and other trash, but there is no legitimate reason for this situation to continue. If you do not have a Concealed Carry License, you should get one. Then become adept at using your weapon. In Missouri, if you are 21 years old, are a U.S. Citizen, and have no felonies or misdemeanors involving domestic violence, then you are no longer required to obtain a Concealed Carry License in order to carry a concealed weapon.